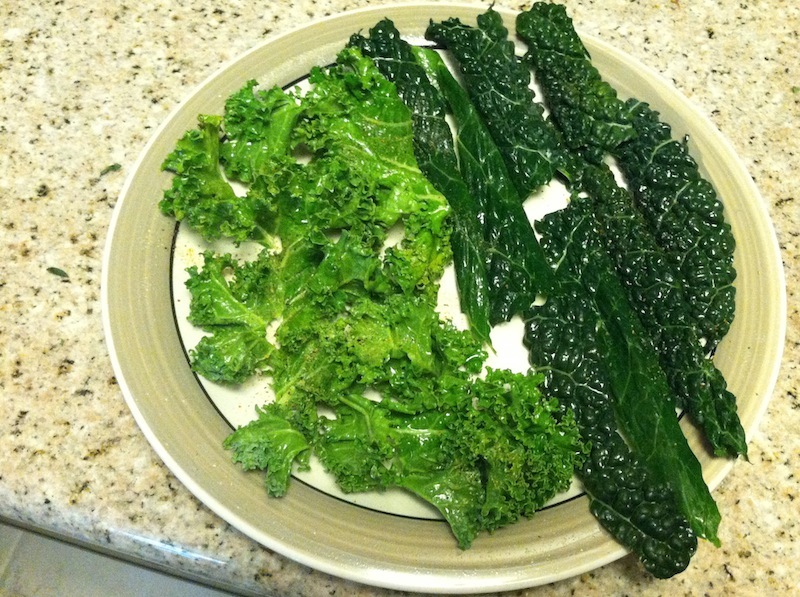 Kale Chips…in the MICROWAVE?! | Keep It Up, David! This post is about food, and I need to fess up and say that my eating hasn’t been great lately. I’ve been exercising like a madman, and while I want to be capitalizing on the calories I’m burning to lose a few pounds, it’s not happening. But I’m not beating myself up over it. Just trying to make better choices and do the best I can. A few years ago, I had a little kale chip kick. I was making them left and right. Kale chips, which are simply kale leaves that are roasted until they’re crispy like chips (see how to make them here), are very satisfying and super healthy. But between preheating the oven and then actually roasting them, they took a long time to make – nearly an hour – which was a long time for a snack I could polish off within minutes. A few weeks ago, I had “Home & Family” on in the background when I heard celebrity chef Rocco DiSpirito say that kale chips could be made in the microwave in a couple of minutes. I dropped everything and my ears perked up, like Scooby Doo. What?!? RELATED CONTENT: Watch My Appearance on “Home & Family”! 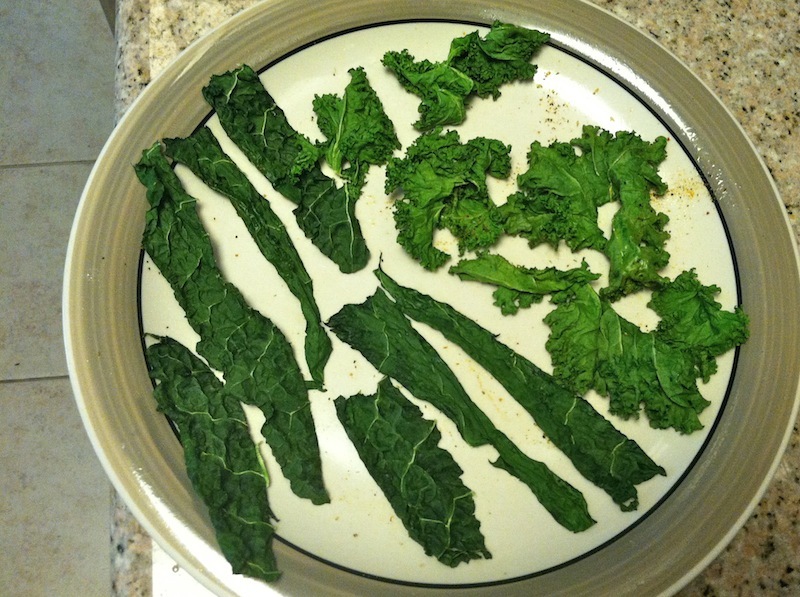 Recently, a friend gifted me with two bunches of kale, so I jumped at the chance to make microwave kale chips. Seriously, if your friends don’t give you vegetables, you need to find new friends! On the left is a variety called Lacinato Kale. 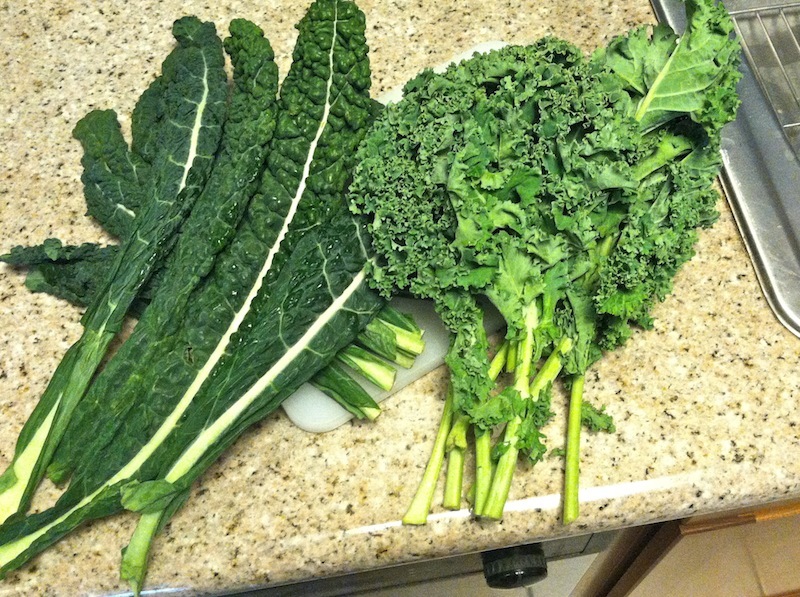 On the right is a variety called… um… kale. It’s just regular kale that you find at the store by the sign that says “Kale.” I didn’t know which would make a better chip, so I made both. 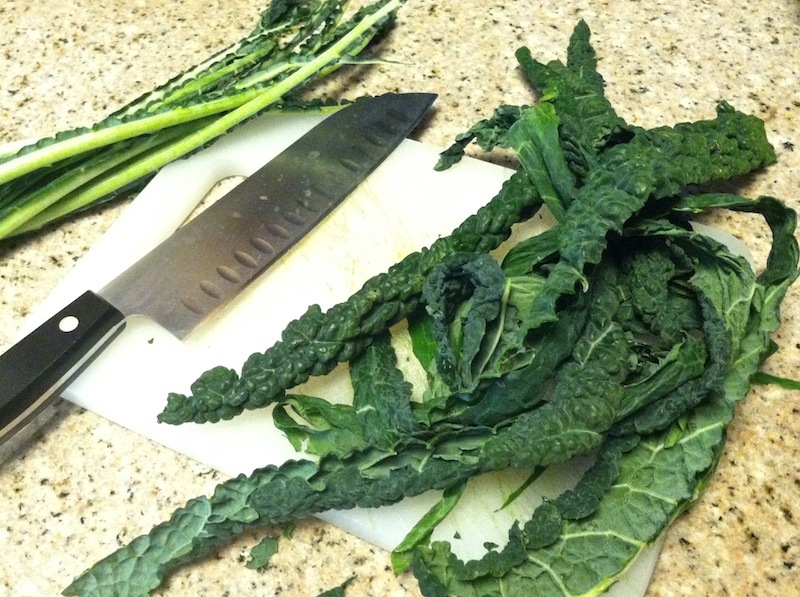 All the de-stemmed kale went into a colander, and I gave it a good wash, and then I used a Spin ‘N Stor bag to dry it. I spread a single layer of leaves on a microwavable plate, spritzed them with a quick hit of Pam, and then tossed on some Garlic and Herb Mrs. Dash. Per Rocco’s instructions, I nuked the leaves for a minute, then took them out and flipped them all over. They were limp and moist at this point. After flipping them, Rocco says they go back in for another minute or so to crisp up, but it took two minutes in my microwave. After those two minutes are up, the kale chips have shrunk considerably, but they’re crispy and delicate and delicious. So which kind of kale made the better chip? I couldn’t decide. They were both fantastic! I ate the whole plate within seconds, and ended up making and eating two more plates over the course of the next hour (and I still have some raw kale left to make some more!). 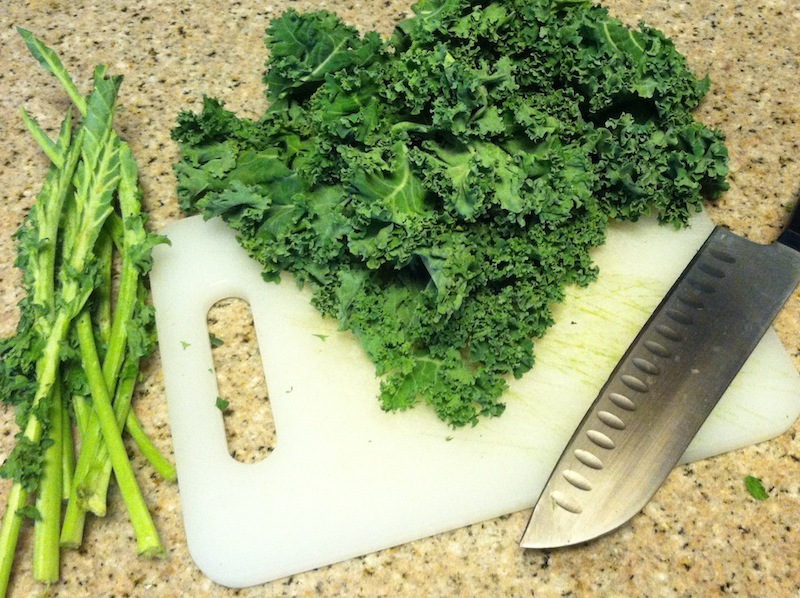 A completely guilt-free snack, made in a fraction of the time that kale chips normally take. You can’t beat that! This entry was posted on Wednesday, February 19th, 2014 at 12:10 am and is filed under Uncategorized. You can follow any responses to this entry through the RSS 2.0 feed. You can leave a response, or trackback from your own site. 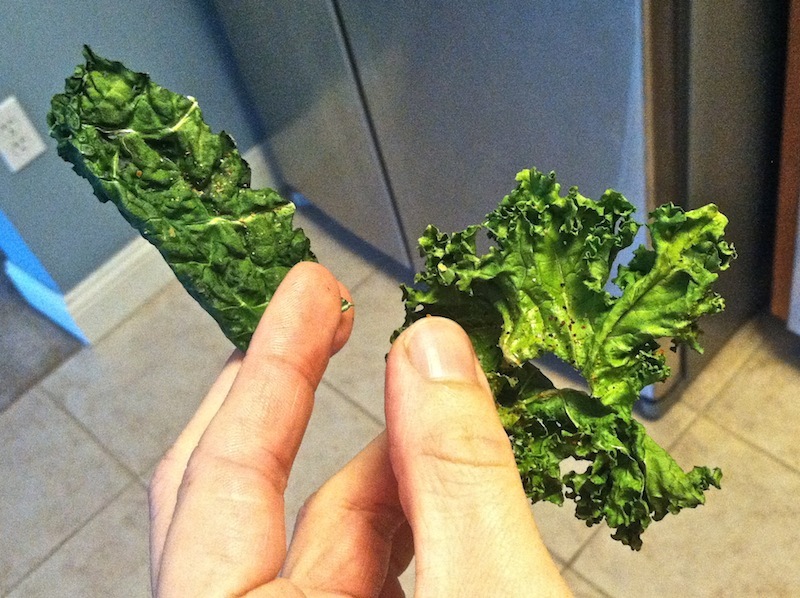 22 Responses to Kale Chips…in the MICROWAVE?! I always fail at making roasted kale chips. Always parts that are burnt along with parts that aren’t crispy. I’m definitely going to try this though!! I hope you do try it and I hope you enjoy! Welcome, Crystal! I’ll check out your site, too. Funny I found your post about kale today. I saw Ina Garten roasting kale on her show & have been thinking about it. On my way to the store & going to get this super food & try kale roasted for a good,guilt free snack. I’m back on WW & know I have to get back to eating more greens. Glad you’re back on WW and workin’ hard. Hope it goes well with the kale chips! That is one awesome friend! He sounds like the coolest person in the whole wide world. You must do amazing things like drive him to the airport at ungodly hours! I love Kale chips. I make them all the time and usually end up eating the whole cookie sheet pan in about 10 mins. Thankfully, my dog LOVES Kale stems! What an awesome way to get rid of the stems – love it! Hope it works for you, Karen! Enjoy. Thanks, as always, for commenting! Can’t wait to try . . . I’ve always planned to try Kale chips . . . this sounds so much easier . . . and – this summer I am going to grow Kale too! Awesome – hope you enjoy. And can’t wait to hear about your home-grown kale! Keep it up! What’s up, just wanted to say, I enjoyed this article. It was funny. add some kind of shake cheese even fake flavour mix it all together on the plate.. lay a couple of paper towels on top ..
keep checking it will eventually get crispy…u can almost smell it.. I just made some before I found this site. I have a 700 watt microwave and they were crisp in 3 minutes. I am scared to think what would happen if I cooked it for 12 minutes! Granted, I didn’t use a plate, but a plastic thingy with ridges and holes that is made to microwave sweet potatoes. I bought it for a few dollars at Wal-Mart. I sprayed some olive oil no them, then sprinkled sea salt. Was too sallty, so I will try it without salt next time. DISREGARD previous message lol….I just tried these and based on my dinner plate and wattage of my microwave (can’t find it), it takes 2:40 minutes total. I do 1 minute, then mix with my hand, then 1 minute more, then mix with a fork and spread out on plate, then I do 20 seconds (this is where any stems I missed catch on fire lol), then I move around with the fork. I usually do another 20 seconds because my plate is full when I started and I want them crispy. Wonderful!!! I use a misto with olive oil, mrs. Dash and a little sea salt. Thank you for sharing! 2:40 for a delicious healthy snack is no time at all! I’m glad you figured it out for your own microwave. FYI my wattage is listed inside my microwave, on a sticker that you can’t see unless the door is open. Maybe yours is there too! I tried this, and it snaps and crackles and then a big zap and a small fire. I did have my kale on a paper towel, and not a plate though. They were crispy, and ok. But not good enough I want a fire in the microwave. Sorry to hear it, Shelly! Stay safe.